A-SET Training and Research Institutes an entirely Indian company has been working on brain sensing from last 5 years. Previously they have made India’s first mind controlled robot. This robot can sense what you’re thinking and based on that the robot will do the things automatically not only that the robot will also bring a glass of water whenever you’re thirsty. They are also the first company in the entire world who has copied human emotion into a robot by the means of brain cloning. This was successfully demonstrated over at TEDxIIM Shillong. Now they have been working over a special wheelchair, which can be used by patients suffering with LIS (Locked in Syndrome) condition. This is a very devastating condition in which the patient looses all his control over the muscles of his body and is not able to move any part of their body. They are not even able to speak or express emotions as it requires muscle movement. In this condition the patients are able to see and hear what is happening around them but not able to respond except for moving their eyes. This leaves them wheelchair bound and spending the entire life like this becomes a battle for the patients. This condition can be caused to anyone. 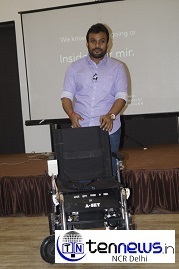 Hence to empower them and give some control of their life back to the patients, Diwakar Vaish, Head of Robotics & Research of A-SET Training & Research Institutes who is also a guest lecturer to over 9 IIT’s, NIT’s, BITS has come forward to change their lives. He has been working on brain control technologies from past 4 years and his work has been appreciated globally. Previously he has also been in limelight for making India’s first completely made in India Robot “Manav”. According to Diwakar it is a responsibility of the robotics experts to not only serve the big industries but also to identify and solve the problems faced by people in the day-to-day life. Talking about the wheelchair Diwakar said, “your wish is its command”. To control this wheelchair you need nothing except for your thoughts, this is the first time that something of this sort has been done and produced to the world commercially. Diwakar further adds, “This might sounds fairly simple however getting the electrical impulse is a very tedious task and then we also need to understand that not everyone’s brain is alike. So if we make one generic program then it might not work for everyone. Therefore, from our prior experience we applied the concept of Machine learning through which we understand how user’s brain functions and then adapts to it automatically. Also the state of mind changes throughout the day and under different circumstances hence we also need to compensate for the same. As this is a consumer product and not just a lab research hence it is our endeavor to make this flawless. We also added various sensors like, temperature sensors, sound sensors and many other sensors to make sure that everything happens just the way it is desired. Even in the case when a wrong command is given to the system then also it won’t move from its position until it checks if it’s safe for the user. Hence there are several sensors that are working continuously to scan the area around and also the surface over which it is working. It can automatically avoid obstacles rough surfaces and even stairs just to name a few. The wheelchair is completely safe as in the case of an emergency. The first reaction of human is to close the eyes in case of any emergency, in such situation the wheelchair will come to a complete halt as soon as a person clenches his eyelids and will wait for a few seconds so that user can recover. Not only that the wheelchair also has a power switch inspired from fighter jets so in any case the wheelchair never gets turned on spuriously. The best part about this wheelchair is that it has been made in India as India is moving forward in the domain of robotics. This will be a big milestone in this field and a big boost to Prime Minister Modi’s campaign Make in India. Prime minister in his Independence Day speech said, “We have skill, we have talent, we have discipline and a will to do something extraordinary”. This wheelchair clearly boasts this fact to the world. When asked Diwakar about the number of units they are projecting to sell he mentioned, “Our Company and our products in past or the future are never driven by sales figures. We know that it won’t be something which will have figures crossing a 3 or a 4-digit figure. We believe that it does not matter how many devices we sell. Even if we sell just one and the device brings positive change in the life of the user and the user is satisfied with the product, it will give us immense satisfaction. Our aim is to give society the technologies that make people’s lives easier.